Honey is a source of carbohydrates – mainly fructose (about 38.5 percent) and glucose (about 31.0 percent). The remaining carbohydrates include maltose, sucrose and other complex carbohydrates. Because of its high fructose content it has a higher sweetening power then sugar. One Tablespoon contains about 64 calories. On average honey is 17.1 percent water. Honey also contains small amounts of a wide array of vitamins, minerals and amino acids including B vitamins such as niacin, riboflavin and pantothenic acid, along with minerals such as calcium, copper, iron, magnesium, manganese, phosphorus, potassium and zinc. Research indicates that honey includes numerous compounds with antioxidant potential. The amount and type of these antioxidant compounds depends largely upon the floral source/variety of the honey. In general, darker honeys have been shown to be higher in antioxidant content than lighter honeys. Honey’s composition also makes it an effective antimicrobial agent. Research continues into the use of honey for treating minor burns and scrapes and for aiding the treatment of sore throats and other bacterial infections. The gastrointestinal tract is full of bacteria. These bacteria are essential for life and good health. One group of bacteria that have been shown to be particularly important to the health and proper function of the GI tract are called Bifidobaceria. One way to increased the Bifidobacteria populations in the gut is by consuming foods containing prebiotics. Prebiotics help these “friendly bacteria” grow and “be happy”. 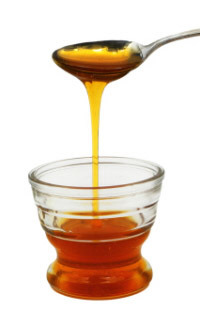 Honey contains a variety of substances that can function as prebiotics. Research shows that adding honey to dairy products such as yogurt can enhance the growth, activity, and viability of Bifidobacteria. NOTE: Honey should not be fed to infants under 1 year of age. Honey is a safe and wholesome food for older children and adults.